In spite of having already done it once before, I was still nervous. 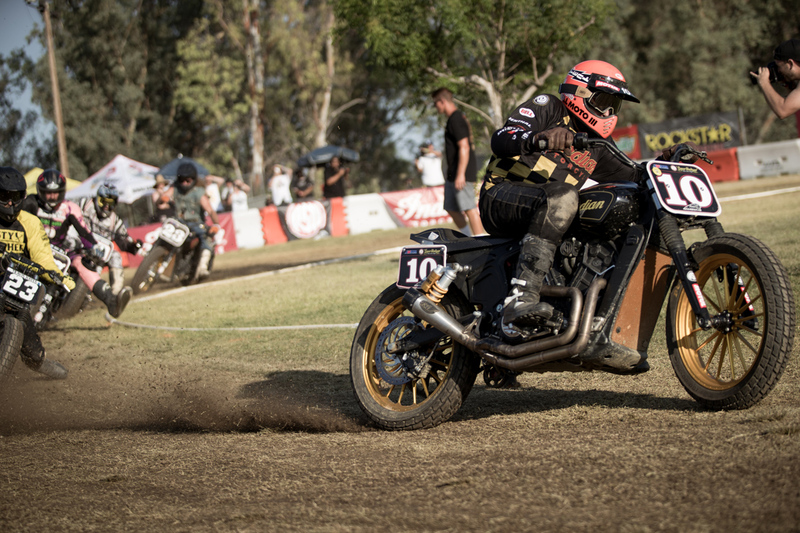 But when Roland Sands and Cameron Brewer ask you if you want to ride a custom Roland Sands Designs Indian Scout in another Super Hooligan race at the second annual Lost Highway Show in San Bernardino, California, you don’t pass it up. 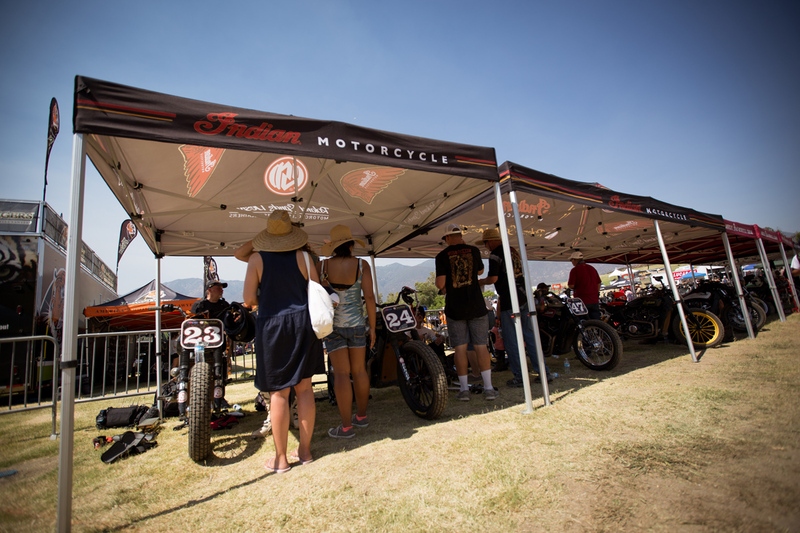 Held at the San Manuel Amphitheater just behind Glen Helen Raceway, this year’s Lost Highway show featured a ton of bands, countless motorcycles on display, plenty of beer, and a Super Hooligan race presented by Roland Sands. 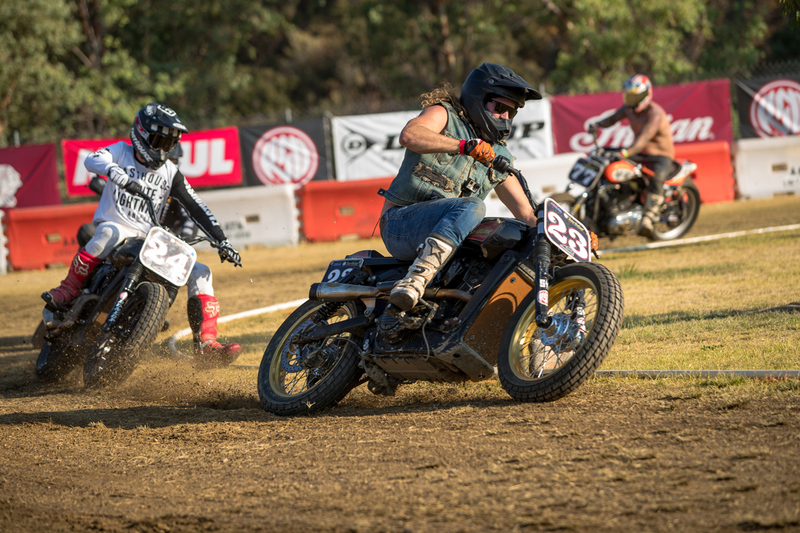 Cut into a grass field in the middle of everything, the small Hooligan track was prepped and maintained by Speedway legend Brad Oxley and his crew, which included his sons—successful off-road racers that you’ve likely heard of—Colton Udall and Ian Young. When I arrived, my anxiety peaked as I walked the track. 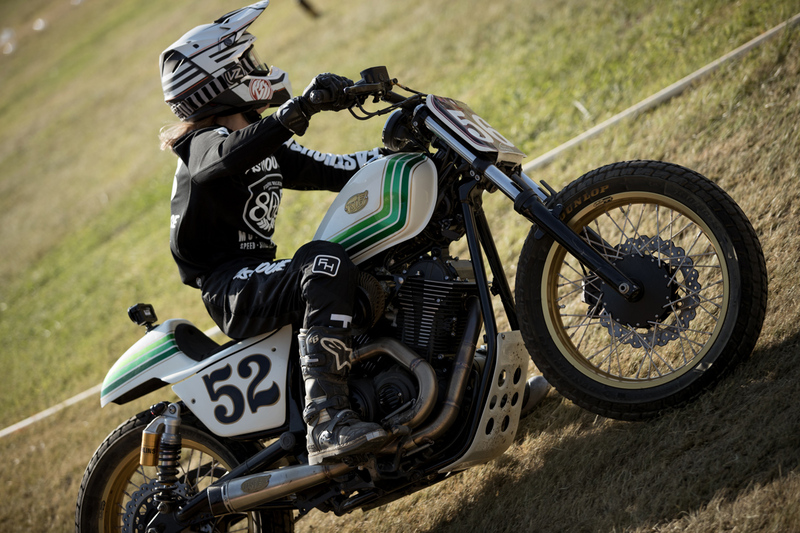 On paper, riding on fresh grass sounds like any two-wheel enthusiast’s dream, but when it comes down to it, grass is slicker than a whiskey fart on a hot summer day—especially when your bike is equipped with dirt track tires and no front brake. Oh, and it weighs over 500 pounds. 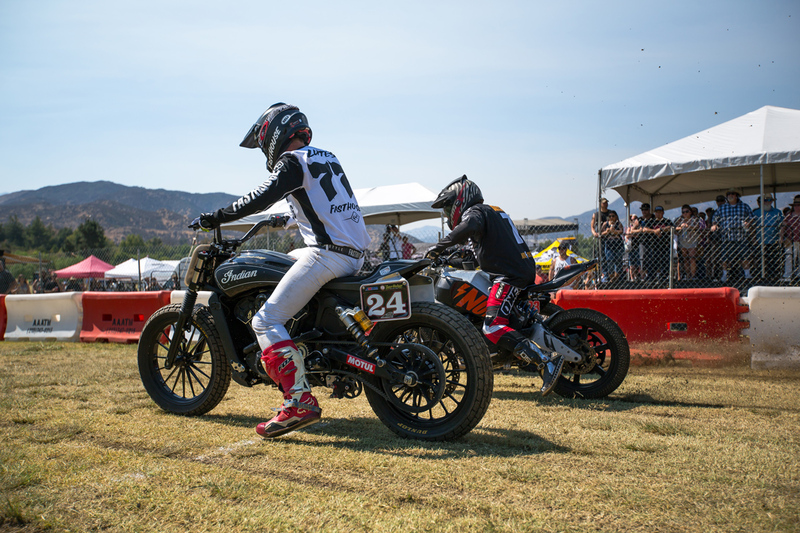 Prior to practice, I tried to remind myself of the skills I learned during my first foray into the world of Hooligan competition in Las Vegas, and put it out of my mind that grass was going to make for an experience. And as it turned out, it didn’t take long before things got interesting. 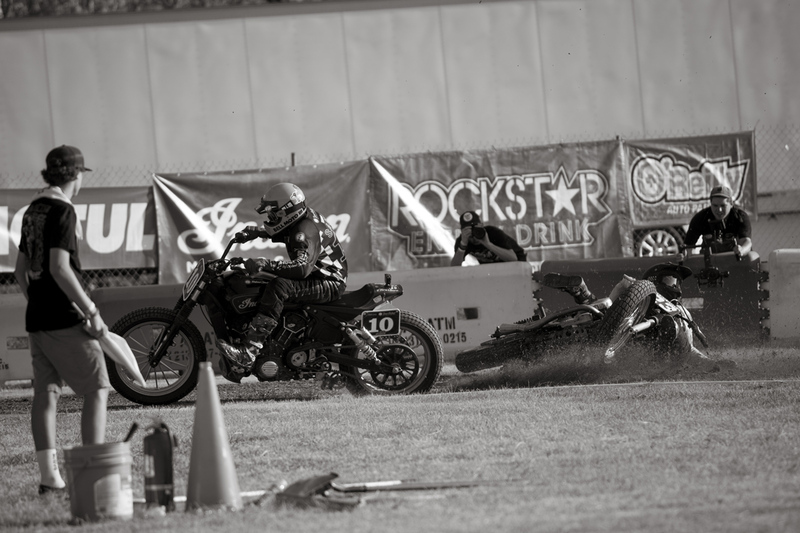 As I sat waiting for my first practice session, I looked up just in time to see Cameron Brewer high-side into turn three and gracefully tuck and roll before popping up on his feet to push his bent up Harley off the track for repairs. But that was tame compared to what happened next. 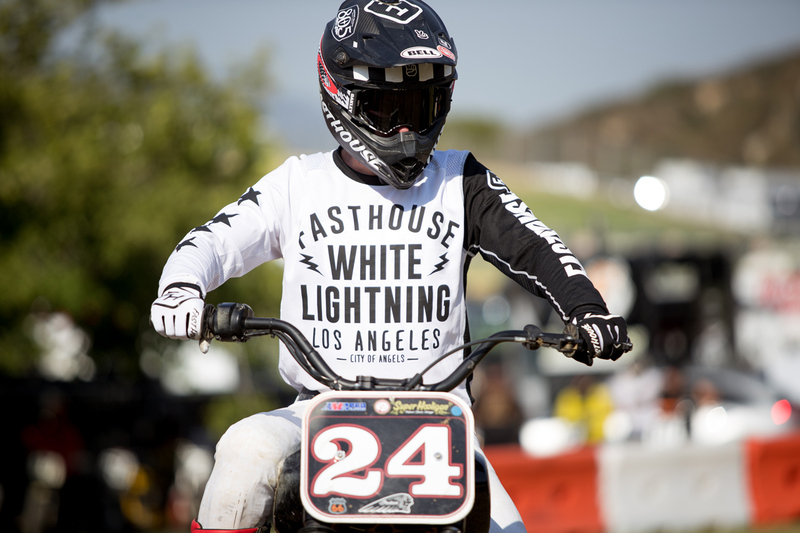 Right at the conclusion of the third session we all watched at Shawn Guardado went down in turn four before getting run over by another rider. 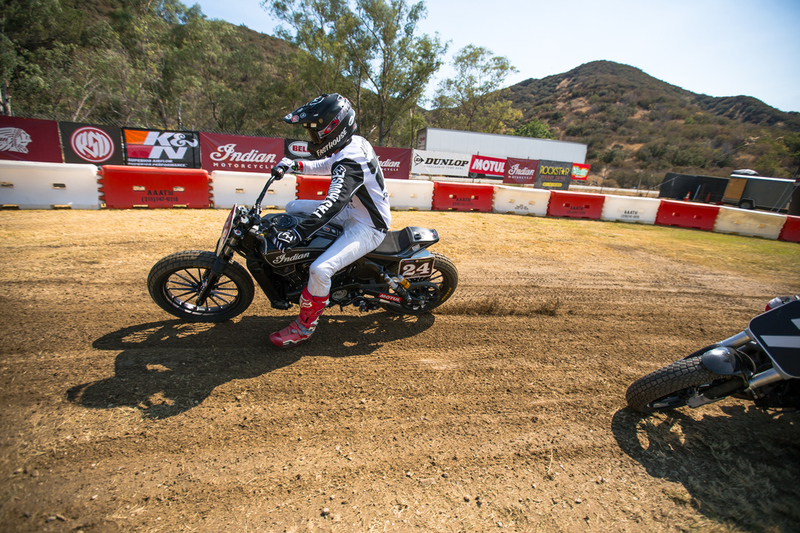 As Shawn laid on the track motionless, everyone held their breath with a look on their faces, as if to say, “This is going to be way—like a lot—sketchier than anticipated.” Thankfully, Shawn got up with a smashed helmet and a bad concussion, but otherwise okay. 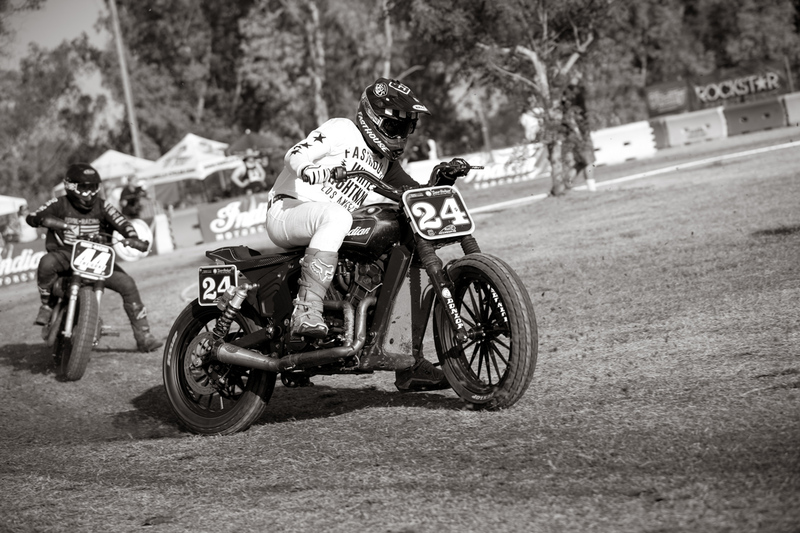 While he walked past staging, I took a deep breath and prepared to pull out onto the track. 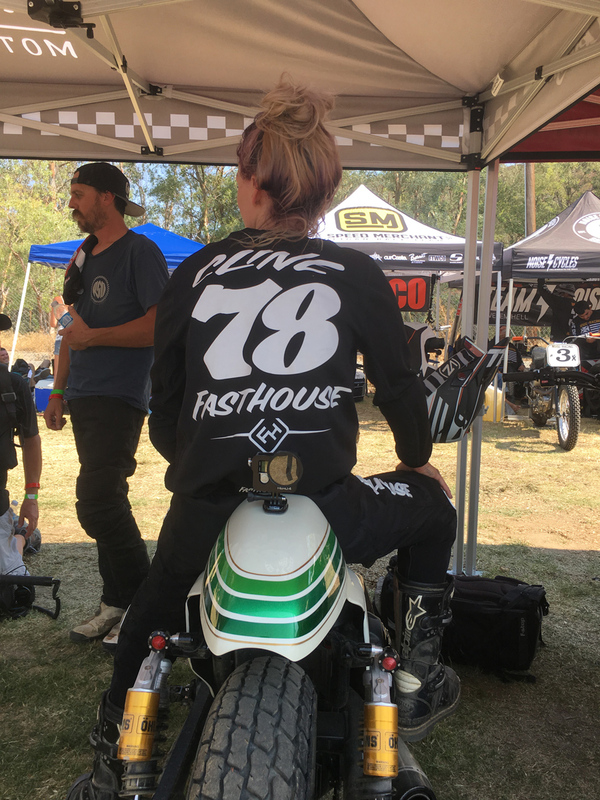 I got a total of three sessions in—15 laps—before it was time to race, and thankfully I managed to get a little more comfortable with each outing. 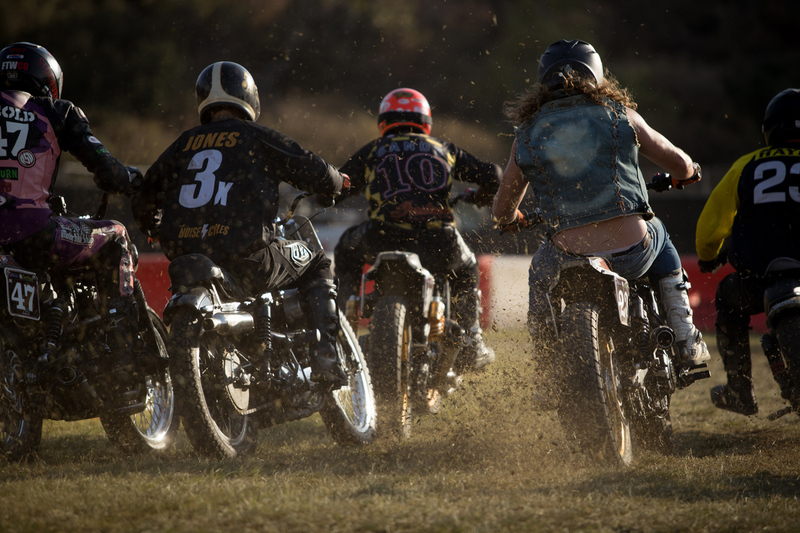 Even though Hooligan racing is intimidating, once you get the hang of it, it’s a damn good time on a motorcycle. 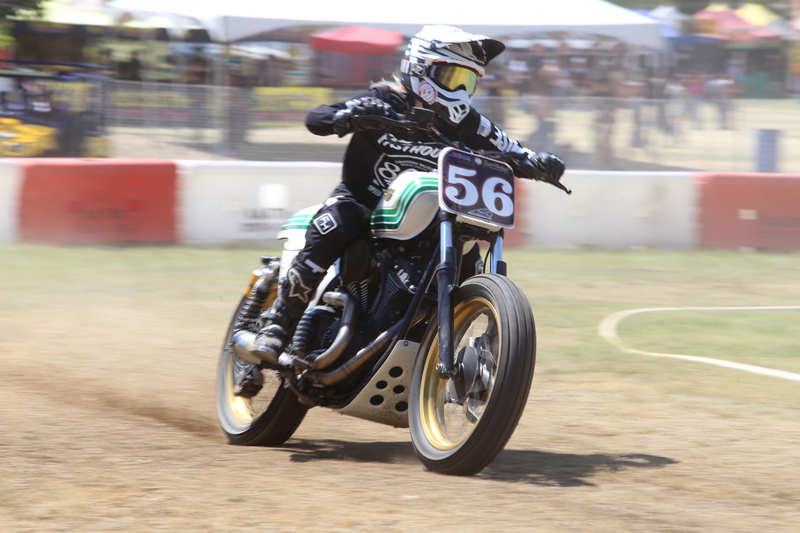 After trying to cool down in the 105-degree heat, I lined up for the first heat race, which when it was all said and done, turned out to be more of a battle of attrition than an actually race, as I was the only one left on two wheels after five red flag restarts. I guess you could say, I wasn’t trying hard enough, but in reality, I didn’t want to get any grass stains on my white jeans. My next race was the semi-finals, which didn’t go as planned thanks to a horrible start, causing me to finish third, punching my ticket to the consolation race rather than the main event. My disappointment, though, quickly changed as I lined up next to Andy Bell. Decked out in his Canadian Tuxedo—denim vest and jeans—I knew we were going to have a good time. And after battling back and forth through five restarts, the green flag waved for the final time. 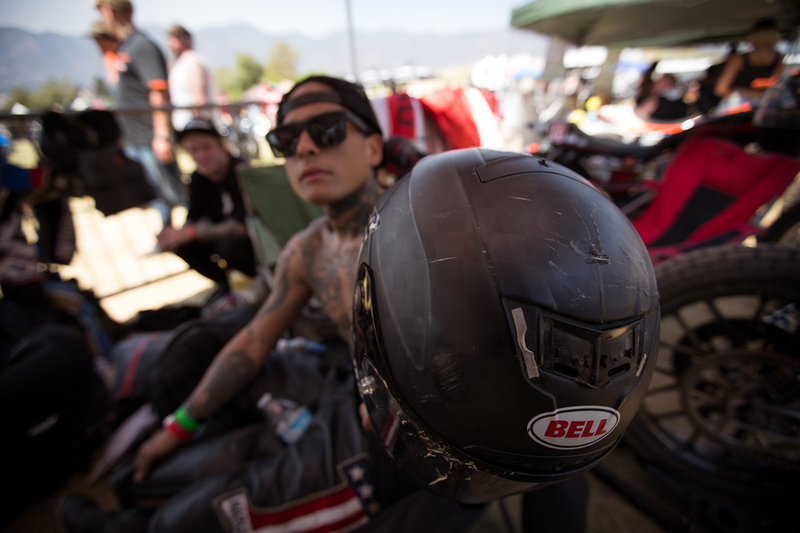 I came into the first corner way too hot and directly at Bell. The resulting t-bone high-sided me into another rider, whom I bounced off of and proceeded to set my sights on Bell out front, but it was too late. After the numerous re-starts, I didn’t have enough time left to catch Bell who was riding like a madman. With that, I sat on the sidelines and watched the finals with my wife and a cold beer. 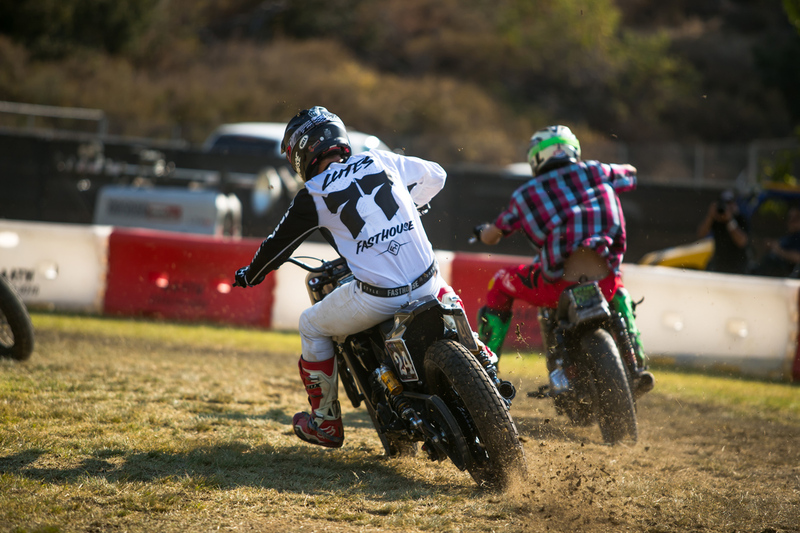 There were lots of crashes on the slick grass track. Leticia Cline represented Fasthouse well. 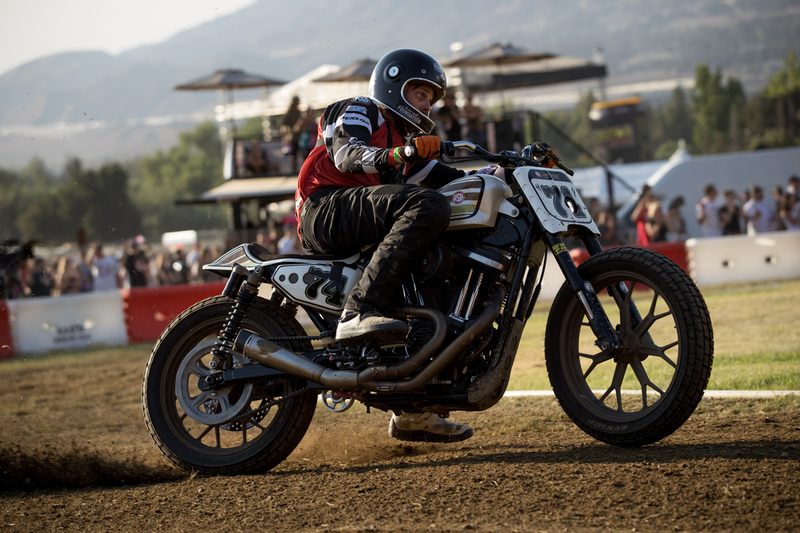 Holding her own with the guys on a 500-pound Harley. 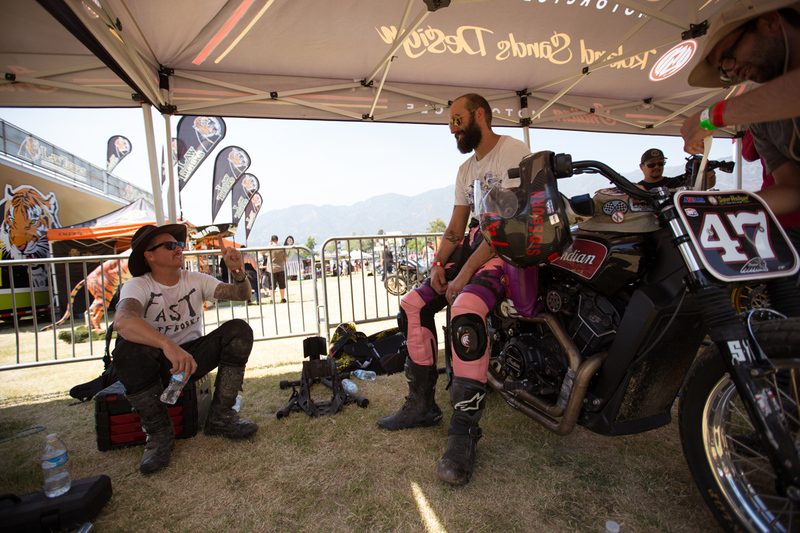 Roland Sands (left) and Travis Newbold (right) discuss line selection between races. After high-siding in practice, Cameron Brewer came back to finish third in the main. 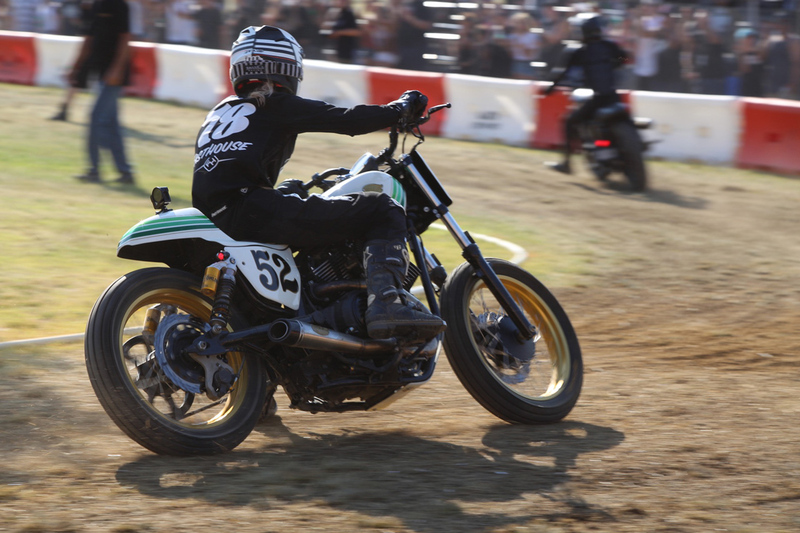 I had a blast during my second go at Hooligan racing. Thankfully Shawn Guardado was okay after his scary crash in practice. His helmet... not so much. The 105-degree temperatures made cooling off pretty much impossible. 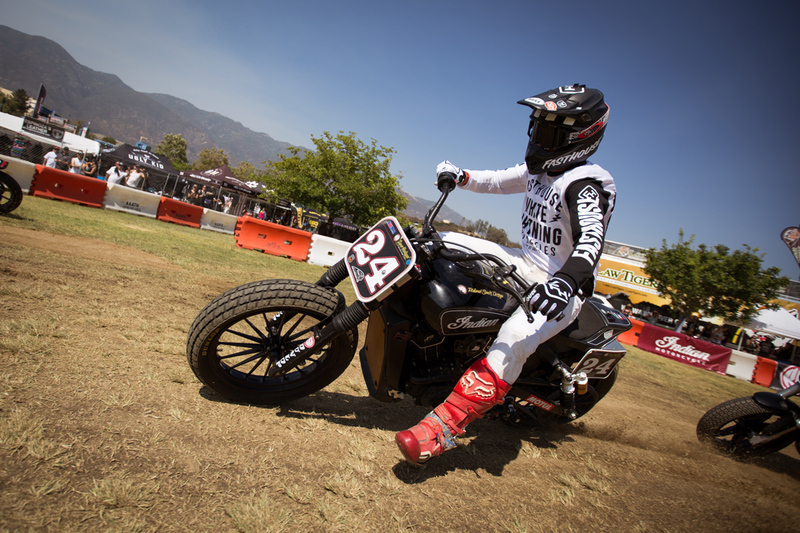 Roland Sands has style on and off the bike. Andy Bell decked out in his Canadian Tuxedo.